I’m not getting political. I’m getting personal. Don’t judge my freedom. Don’t judge my hashtags. Don’t judge my joy. Back to School is upon us and I’m whistling Dixie. I’m going to hashtag the life out of my happiness and I’m totally not okay with you judging me for it. Especially, if you don’t have children. Bite your tongue and watch me bask in the glory of personal triumph . . . I made it another summer. I did it. Quit shaking your head at me questioning what I’m going to DO with my time. What time? I have the same responsibilities, chores, tasks and appointments I did all summer long. But, now I get to do them with a shred of dignity. I can use the bathroom myself. I can make a phone call myself. I can eat a meal without someone asking me for something, ANYTHING before I take a bite. Parents have intense responsibilities over the summer. We are drivers, cooks, swim coaches, nurses, cleaners, laundresses, counselors, alarm clocks, door mats, event planners, and teachers. Morning, noon, and night . . . we are the Panama Canal . . . everything runs through us. Until one morning, we wake up and realize the end is near. And, like viewing the eclipse, we patiently wait and try not to stare directly into the light. We wait for family structure to suddenly reemerge. I bet some of you are rolling your eyes. Go ahead. I’ll respond with the same word I used on my children the entire summer, ‘stop’. Yes, we took trips and I enjoyed them. But, let’s be honest, I had the same responsibilities on our trips as I did at home. I cooked, cleaned, and made sure the little peoples’ heads remained safely above water. I don’t have a single picture of me clutching a coconut cocktail while sunbathing in Tahiti. Because, that is a vacation NOT a trip. And, summer with children is defined by trips. By September, I’m ready to regain sanity. While I run a tight ship over the summer involving healthy meals, reading, and limits on screen time, the long hours creates empty spaces. Those empty spaces quickly full-up with fighting and mischief. And then, magic happens. The weather breaks and school comes along to save us from our impending insanity. I equate summer to childbirth. We forget the pain. June arrives and we hack up a watermelon, book a beach weekend, and celebrate the season. We embrace the lack of schedules and coo over the first firefly (not the cocktail, the bug). Summer is great, until it isn’t. 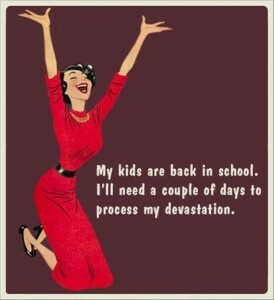 Homeschooling parents, working parents, stay-at-home parents all take a collective sigh and embrace the start of school. When checking social media this time of year, smile. Don’t judge. Parents all over are still working feverishly to run their households. Yes, we can go to the gym or sneak away from our desk for lunch easier because were not chasing a camp pickup or dragging three kids everywhere with us. Trust me, we make up for the school day hours with the extra time homework and activities pile on us during the school year. So, let freedom ring. Let toilets flush without being talked to under the door. Let the poor moms of toddlers stand upright and not bent over trying to help little feet into the pool for hours. Summer has ended. The coast is clear. Smarty Steal Alert: Get 20% off Your Order of Grund Organic Bath Rugs! UnPlug with Hands-On Learning from Fundanoodle!